WHITE-HOT OBVERSE! 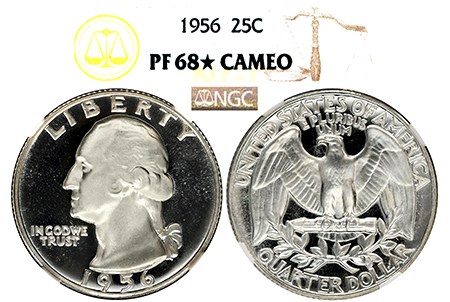 This 1956’s obverse is drenched in bright-white frost popping off starkly contrasted, pitch-black mirrors! The reverse features heavy, fully frosted Cameo devices creating superb black-and-white contrast against spectacular mirrors! 176 graded by NGC.